London based Sweet Hollywood specialise in Unique wedding cakes in London and our latest bespoke wedding cake is exactly that. Introducing Runway by Luxury wedding cake makers Sweet Hollywood! 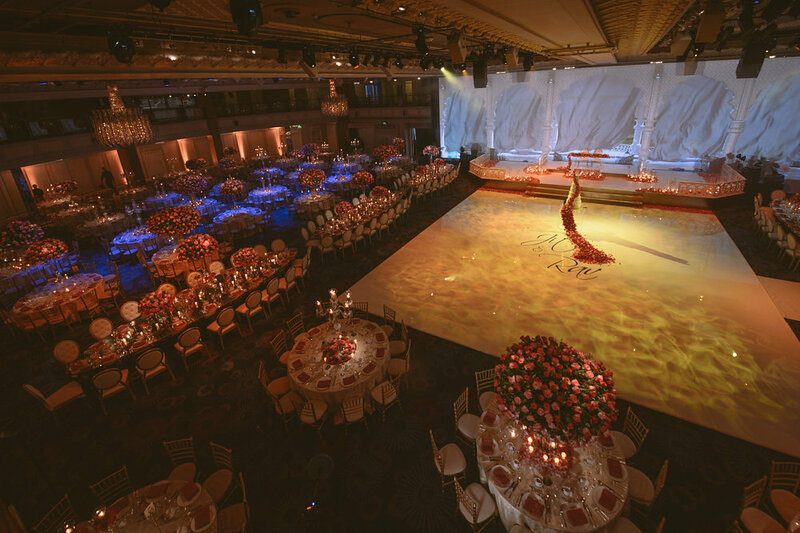 The lavish Asian Wedding Reception @ Grosvenor House London was planned and managed by Parvy Rakar from Snob Events. Parvy ’s attention to detail and highly creative approach, meant she was looking for something unique for her discerning Sikh clients Rav & Jit’s glamourous Asian wedding reception. With the above in mind Sweet Hollywood were delighted to create another unique wedding cake design that we own the design rights to. 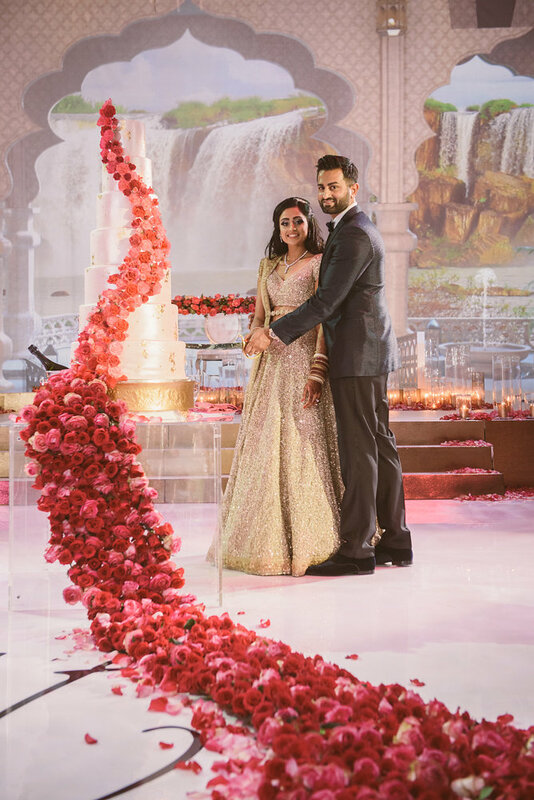 The stunning creation “Runway” featured a bed of hundreds of fresh flowers that cascaded and merged with the stunning sugar flowers that featured on the unique wedding cake. 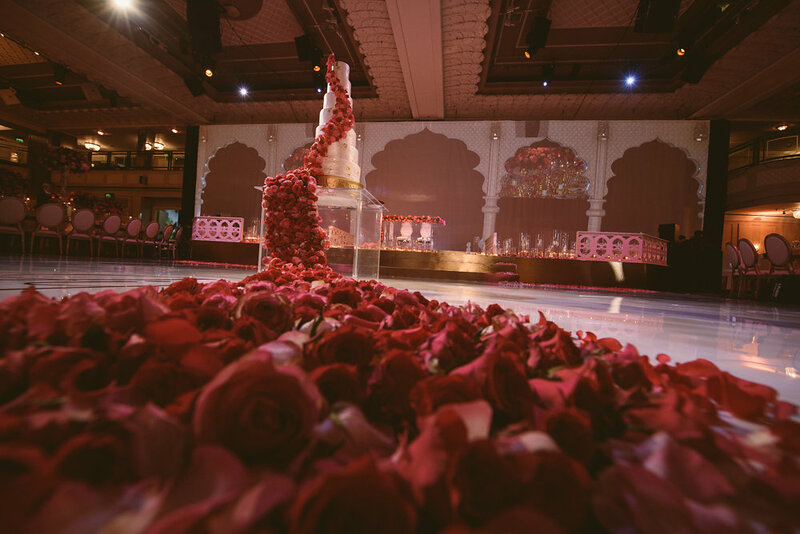 The cascade of sugar flowers trailed the grand wedding cake beautifully and the colours matched the fresh flowers to perfection. 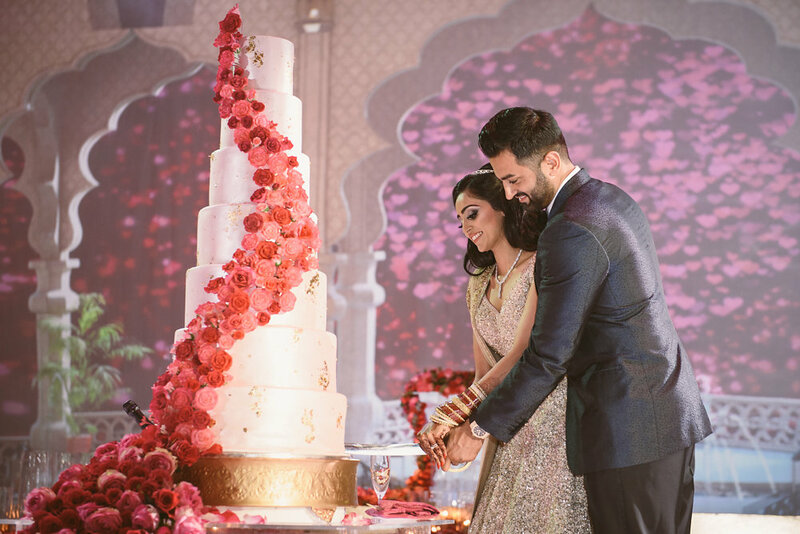 The unique grand wedding cake featured a stunning finish with touched of 24 carat gold leaf that added to the stunning detail of the luxury wedding cake. With the high ceilings in mind of the Grosvenor House Great Room and over 700 guests in attendance the clients also wanted a tall wedding cake. 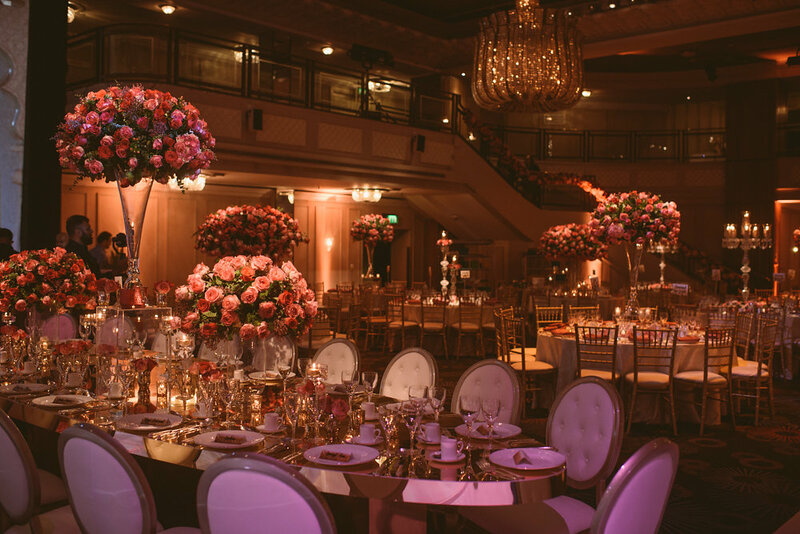 Sweet Hollywood worked with our superior sized tiers to get the wow factor and towering height the clients were looking for. With our clients, dietary requirements in mind they opted for an eggless wedding cake sometimes referred to as an Asian wedding cake or egg free wedding cake. The sponge was moist, light and fluffy and had lashings of luscious lemon butter cream that was very light and refreshing after the delicious Madhu’s wedding food / banquet. 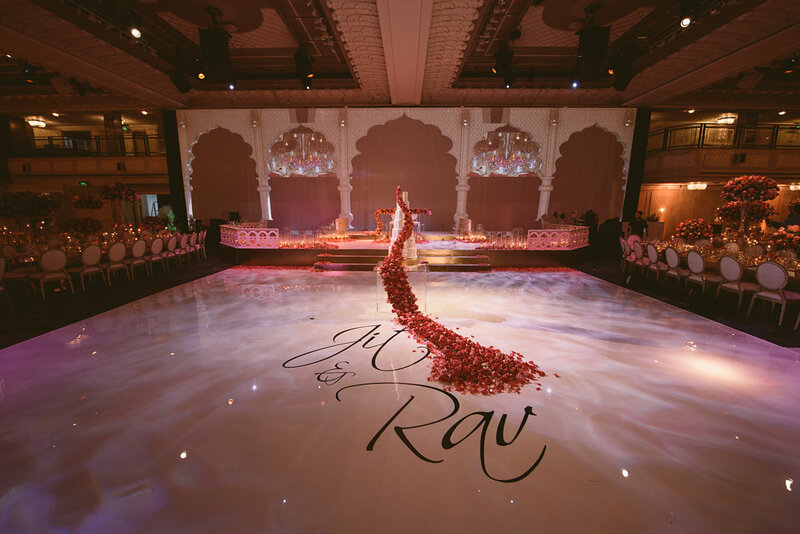 These stunning pictures were captured by the official Photographer Gurvir Johal. Gurvir is a Midlands and London based Asian wedding photographer. Covering Sikh weddings, Hindu weddings, Indian weddings and Asian weddings. I am sure you will agree these stunning wedding photos do speak for themselves. 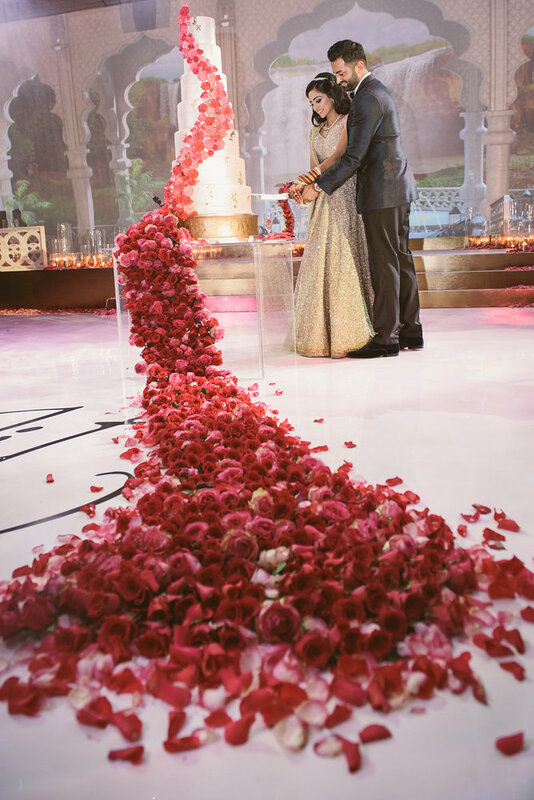 What does 20,000 beautifully placed fresh roses create? 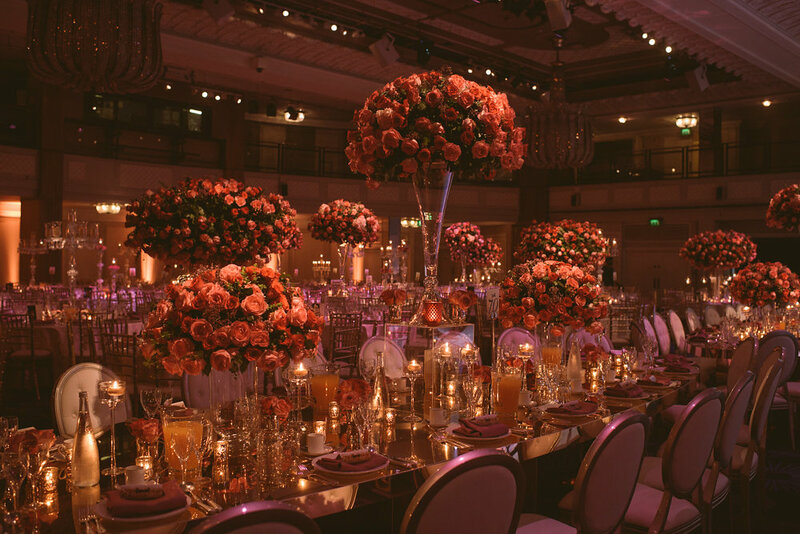 The most stunning setting for a lavish Asian wedding reception @ Grosvenor House. 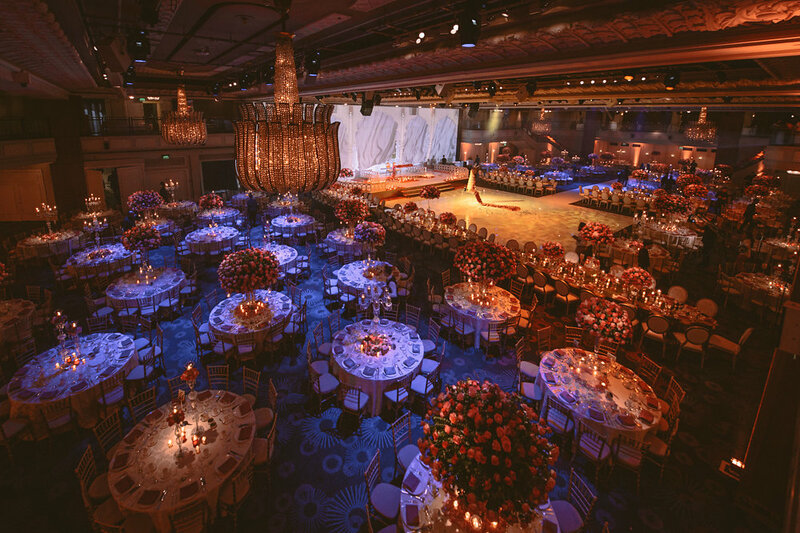 The officially appointed RWS Royal wedding services brought the magic into the stunning, spectacular Great Room @ Grosvenor House. 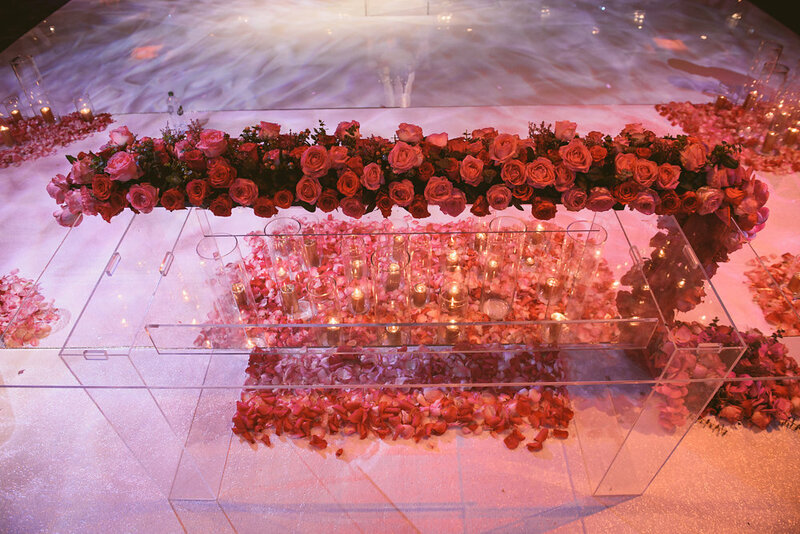 Yes, over 20,000 fresh roses were carefully selected in the spectacular floating floral rose cloud displays. 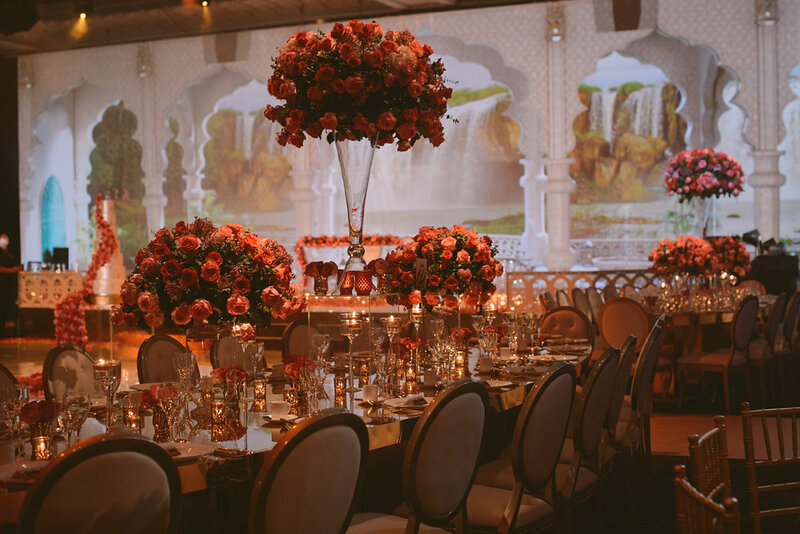 Snob events and their clients wanted to create a lavish feel and opted for fresh flowers, with this RWS – Royal Wedding Services added bespoke mirrored table tops and luxury Louis chairs to set the lavish theme and beautiful wedding décor. Added into the mix was decadent baccarat crystal candelabras and the romantic glow of abundant candlelight.